This is a post I'm doing with BlogHer and Huggies on baby's first year. Being pregnant is one of the most amazing things that can ever happen to a woman. All the changes in your body and feeling the baby are so hard to even describe to someone. It's like nothing you could ever imagine. Having a baby is exciting to the husband as well but sometimes it's hard for them to get as involved with the pregnancy because they aren't physically experiencing the baby so bonding is a little more difficult. What are ways that husbands can be more involved with the pregnancy? The first and most important thing you can do is to communicate with your husband. Tell him everything you are feeling (well - maybe not EVERYTHING - some guys can't handle all the details, ha!) Let him know each week how you are growing and describe as best as you can how you feel the baby. Have him take weekly pictures of you and help you document the pregnancy. Comparing the pictures and seeing the growth can help him visualize how the baby is growing. Another great thing when possible is for your husband to attend as many doctor's appointments as he can. This can help him feel informed and experience things like hearing the baby's heartbeat to asking the doctor questions to seeing ultrasounds. If you have the chance to do a 3D ultrasound - take your husband and make a date out of it. Getting to see your baby move around and in a more life-like form is amazing! Husbands can also get involved with getting the nursery ready and showing him all the gifts you get from showers or family and friends. Talk to him about all the things a baby will need and decide together what kind of gear you will use. I LOVED letting my husband feel the babies kick. Any time they got active and he was around, I would have him put his hand on my belly. Have him talk to the baby (if he doesn't feel dumb doing it, ha!). Having a baby is a team effort. The first time, dad is going to feel nervous and anxious and not know what to expect, but the more he is involved with the pregnancy, the more he will begin to feel like a parent and feel more prepared for the baby to come. What are some ways you involved your husband in your pregnancy? Check out the Huggies Mommy Answers Facebook app! 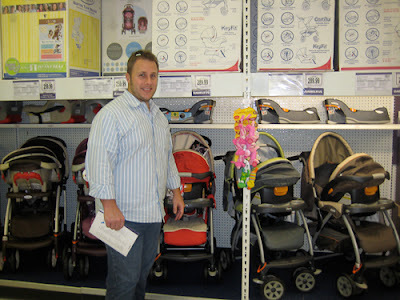 Find more posts from bloggers sharing their experiences of motherhood on the Huggies page on BlogHer.com.